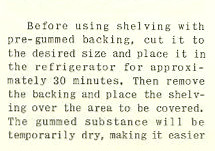 A tip on using contact paper, referred to here as "shelving with pre-gummed backing," that recommends placing the paper in the refrigerator for approximately 30 minutes before use. This makes the adhesive easier to work with. Vintage tip from George Mobayed, Brooklyn, NY; published in Household Help, vol 5 (more here).